“Language acquisition does not require extensive use of conscious grammatical rules, and does not require tedious drill. It does not occur overnight, however. Real language acquisition develops slowly, and speaking skills emerge significantly later than listening skills, even when conditions are perfect. The best methods are therefore those that supply “comprehensible input” in low anxiety situations, containing messages that students really want to hear. These methods do not force early production in the second language, but allow students to produce when they are “ready”, recognizing that improvement comes from supplying communicative and comprehensible input, and not from forcing and correcting production.” (from Principles and Practice in Second Language Acquisition). Initially (and this period could last for some time!) students should focus on internalizing vocabulary and structures and responding to commands. Like a small child, listening and understanding must come first. Speech, when it does emerge, will contain some errors (think of a toddler learning to speak), and errors are worked out as the student continues to interact in a language-rich environment. Second, please avail yourself of additional opportunities for listening and interacting in the language. I highly recommend that you try a variety of these awesome links. 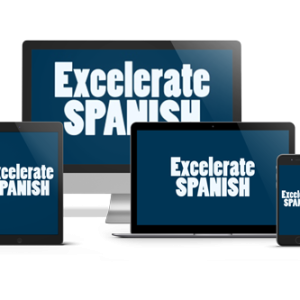 You will find FUN and helpful content such as authentic Spanish language music, Comprehensible Input (CI) resources, grammar lessons, and more. Be creative! Seek out Spanish language podcasts, news articles, poetry, music, etc. 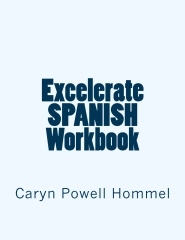 Please share great finds on the Excelerate SPANISH facebook page. If ever you run into a problem or have questions, please reach out to me. I am happy to provide support anytime. I’m here for you. I will only succeed when you do!